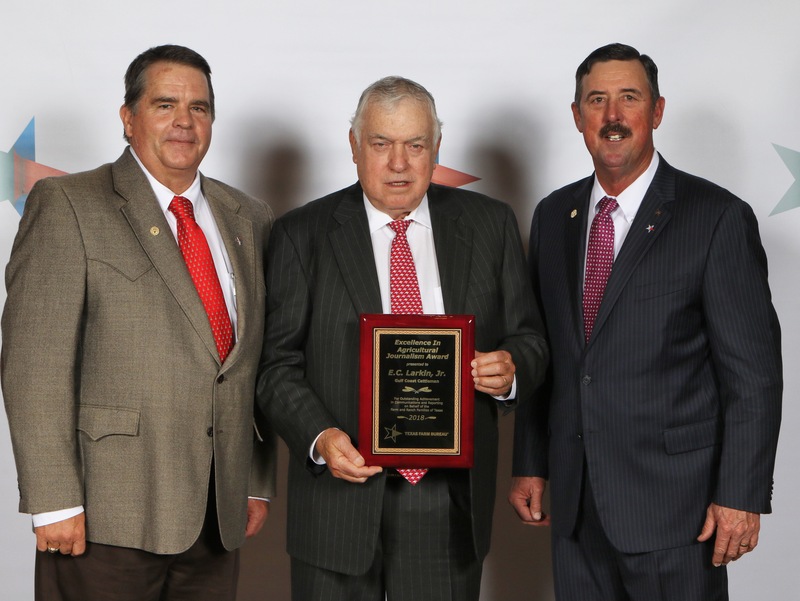 (CORPUS CHRISTI, Texas)—Texas Farm Bureau (TFB) honored E.C. Larkin, publisher and editor of the Gulf Coast Cattleman, with its 2018 Excellence in Agricultural Journalism award for outstanding coverage of Texas agricultural issues. Larkin received the award during TFB’s 85th Annual Meeting Dec. 2 in Corpus Christi. The Gulf Coast Cattleman, established in 1935, covers the beef cattle industry of the coastal states. Wilson County Farm Bureau (CFB) nominated Larkin for the award. Larkin is considered the driving force behind every word in the Gulf Coast Cattleman, using his own unique blend of wit and wisdom to his column and news stories. Wilson CFB considers Larkin a major player in the cattle business, with the publication serving as a source of ideas, technology and production information that significantly contributes to the industry. For outstanding coverage of agricultural issues, E.C. Larkin, publisher and editor of the Gulf Coast Cattleman, received the 2018 Excellence in Agricultural Journalism award at Texas Farm Bureau’s 85th annual meeting in Corpus Christi.